OMG it seems as if I’m constantly telling my kids to get organized! Then I assess their room to see what else I can add that will keep their stuff off the floor and out of my sight…so I don’t go nuts! After several years of nagging and assessing I came up with some pretty good storage ideas that you’ll find below. Hope these help! If your kid’s bedroom is big enough, consider creating small spaces for specific kid activities, so your child will keep things where they belong. For instance, you could put the Single Sided Book Browser by Guide Craft on one side of the room, stock it with great books, add a bean bag chair or soft rug to the floor and voila…your kid will have the perfect reading spot. So, this would make it obvious where books are to be put when he’s done reading for the day and hopefully the space will stay a little neater. If you’re working with a tight space, consider a bed like the Newbury Twin Mates Bed that comes with three deep drawers below that are perfect for storing away lots of kid things. This will give you storage where usually there’s just wasted space. Take advantage of your child’s open walls by adding tons of high storage units like the Contemporary Bookcase by SouthShore This bookcase is offered in 3, 4 and 5 shelf versions that you can pair together to create an incredible, vertical storage area against any wall in your kid’s bedroom. If kids are playing with their toys and the toy chest is too far away, they might just leave the toys on the floor. 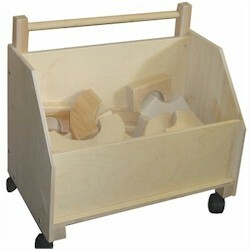 So consider getting a movable toy chest like the Toy Chest on Wheels by Beka. This way, the toy chest can go wherever your kids do and clean-up time will be much more appealing. If you need tons of storage consider getting some that add a little pizzazz to the room decor like the Sort It and Store It Bin by KidKraft. 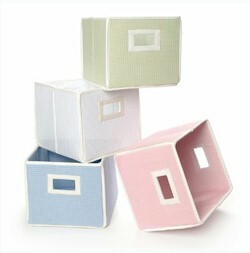 This storage piece has tons of colorful storage bins that are as great looking as they are functional. 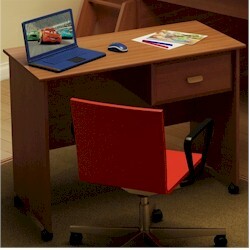 If you don’t have a ton of room for a big kid’s desk, consider getting a small one like the SouthShore Imagine Small Desk. It’s true that if a kid has a designated homework spot, homework is more likely to get done! Look around your kid’s bedroom and see where there’s open space then find a storage piece that would fit just right. For instance, I’m a huge fan of under-the-window storage and seating, because below windows is typically a wasted space. If you get a piece of kids furniture like the Bench Toy Box by Little Colorado, your child can keep books inside and read them while sitting on top. Clothes don’t only need to go in drawers. Why not hang your child’s most worn items, like favorite jacket, hats, scarves and more on a storage hanging unit like the Clothes Tree by P’kolino. If you have this in the room your kid’s coat is bound to land on a tree branch instead of the floor. 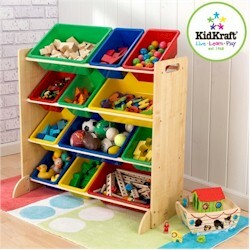 My favorite type of storage pieces are adjustable units like the Babyletto Storage Cabinet that is a combination of storage drawers, open cubbies and cabinets with doors. This clever Babyletto furniture is sold in singles or together as one unit, but pieces can be arranged in any way they fit best! This lets you get exactly the type of storage your kid’s bedroom needs. To get a spot for keeping specific items organized, like white socks and black socks, hair bows and bands etc… get several storage bins like the Folding Nursery Baskets by Badger Basket that can be used in closets, on shelves, under beds or free standing. Kids have so much stuff that, no matter the room size, things still seem to ooze out onto the bedroom floor. That’s why it’s important to utilize every bit of extra space for storage, including the head of the bed. That’s where bookcase headboards for kids twin beds, kids full beds or kids queen size beds come into play. 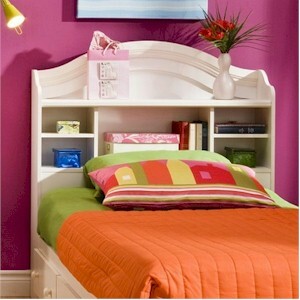 These headboards are designed with various types of storage space. Some come with just open shelves and others have shelves and cabinets, plus cord holes to keep electrical cords out of sight. By adding a bookcase headboard to your child’s bed you’ll be giving your kid an extra chance to keep his/her bedroom clean and organized. Bookcase headboards offer space where your child can keep favorite books, tissues, flashlight, fan, stuffed animals and any other bedtime essentials close by, so that when it’s time for lights out things will get put away not tossed away onto the floor. SouthShore Furniture makes several bookcase headboards, but two particular bookcase headboards are best sellers and doing their part to keep lots of kids’ bedrooms organized. I’ve included our two best selling Bookcase headboards for twin beds below. Most of our headboards come in various sizes and finishes, so you can fit it to your child’s current bed type and color. 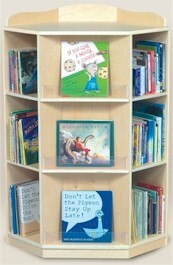 If you want to see all of our bookcase headboards please stop by SimplyKidsFurniture.com today! The SouthShore Cakao Twin Bookcase Headboard in Chocolate adds storage and modern flair to the head of your child’s twin bed. It has a top shelf, plus three cubbies where your kid can keep bedtime items in order. The SouthShore Summer Breeze Country Twin Bookcase Headboard in Vanilla Cream also comes in Chocolate, so you can pick which color works best in your kid’s bedroom. 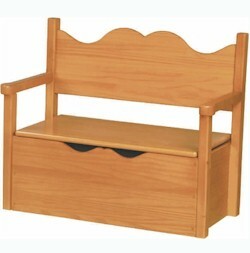 It coordinates beautifully in a classic or country decor and offers lots of space for storing plenty of kid things. It even has a cord hole to keep electrical wires hidden. 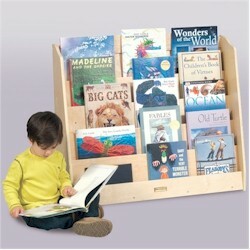 One kids furniture storage item that is often overlooked is the media center. SouthShore Furniture knows that media centers are a great choice for a kids bedroom or playroom and that’s why they offer lots of them in a variety of finishes and styles. Below you’ll see a few of our favorites. The following SouthShore Furniture media centers can be a great help by offering a spot for a TV up top and providing drawer and shelf storage space below. 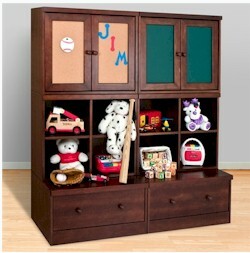 Your child can keep favorite DVDs, Games, CDs and other media items hidden to create a neater bedroom or playroom decor. 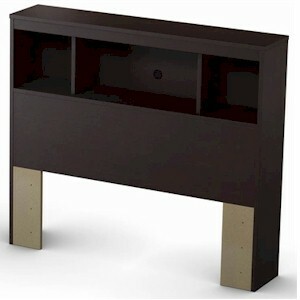 Check out a few stylish choices or view all of SouthShore Furniture’s Media Centers at SimplyKidsFurniture.com today. This SouthShore Furniture media center is the definition of stylish and functional with its contrasting finish and frosted glass doors and metal accents. The deep chocolate finish along with silver handles and metal legs makes this a modern looking storage piece and the roomy top shelf can hold a 36” to 40” TV. Below you’ll get hidden storage compartments for keeping the space looking tidy and you also get open shelves for holding equipment. The six cord management holes allow you to keep electrical wires out of sight. This is one modern and multifunctional media center that is perfect for any child or adult’s bedroom, playroom or any other room in the home. 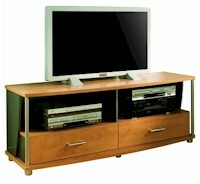 This SouthShore Furniture media center in a beautiful Honeydew finish can easily match any bedroom or playroom decor. 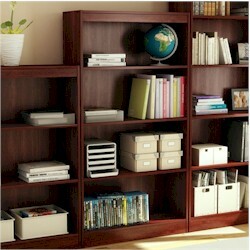 It’s the ideal storage space for everything that has to do with media including: DVDs, CDs, Games and more. The bottom drawers keep things in order and out of sight and the top two shelves give you the perfect space for stereo equipment. On the very top you can place a 50” TV. The electrical wires can be kept out of view through the six cord management holes. This well-built unit is ideal for any space in your home and will last through years of use. 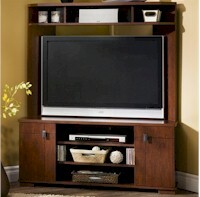 Maximize room space by getting this unique media center by SouthShore Furniture. The Vortex TV stand is designed to fit into the corner of a room, so an area that’s not typically utilized can turn into amazing storage space. This solid unit has a top that’s big enough for a 42” TV. Above the TV area are open compartments where you can keep pretty knick knacks or media items. Below are three open shelves bordered by two cabinets to give you plenty of space for keeping important items organized. This unit is so stylish with a lovely Cherry finish that it’s perfect for any kid or adult’s bedroom or a den or playroom. Storage space doesn’t have to be boring and Powell Furniture proves that with their huge selection of uniquely designed dressers and chests. Give your child a stylish and colorful bedroom decor that’s also incredibly organized by adding Powell furniture to the space. Powell satisfies everyone’s personal design tastes by offering a variety of bedroom furniture that spans all styles from traditional, to modern to boutique and unique. 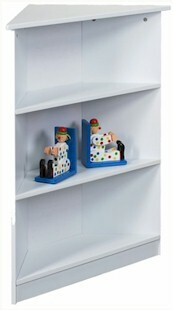 See some of their really fun and unusual storage pieces below and to view the entire line of Powell Furniture visit us today at SimplyKidsFurniture.com. The Powell Furniture Monster Bedroom Collection offers everything a child or teen needs to have a really cool space that’s completely organized. This bedroom line offers everything from beds to dressers to nightstands and more, so you can give your child that modern bedroom with modern conveniences that today’s kids want. Below are a few of the Monster Bedroom storage units that can fit together beautifully in a space to offer a spot for all your child’s things. These pieces are made with steel frames and chrome plated drawer fronts and laminated tops for extreme durability and long-lasting designs. The Powell Furniture Parisian Collection offers an elegantly, feminine line of bedroom furniture that is inspired by Parisian architecture. Each piece is soothing to the eyes with a mix of soft pastel colors on every drawer front. These furnishings are built-to-last with steel frame construction and are protected by a pewter metal finish that will ensure each piece will stay looking new for years. This line includes everything from beds to storage pieces to accent items to create the dream room that every girl deserves. The Powell Furniture Teen Trends Collection offers rugged and masculine looking furnishings that any younger or older boy would absolutely love. This line is the perfect choice for that young athlete or sports lover in your family. If you get a bed, plus storage pieces from this collection that active boy in your life is sure to have a fun and organized bedroom decor. Each storage piece is built of powder coated square tube, barstock and sheet steel for extreme sturdiness and you can mix and match colors to create a very exciting and invigorating space.